We cordially invite you to take a delight in the lure of our mountains and spend pleasant moments in our three star hotel Poľovník with newly build wellness centre in its area. With its central position, hotel Poľovník predetermines the ideal vacation for active holidaymakers during both summer and winter season. Our hotel is located in the quiet surroundings in the middle of the nature at the beginning of Demänovská valley. Hotel Poľovník is an ideal place for family vacations, romantic getaways but also for company outings and trainings, various family celebrations or weddings. 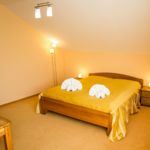 Hotel Poľovník*** offers accommodation in single bedrooms, double bedrooms and one suite for two people. There is possibility of extra beds too. 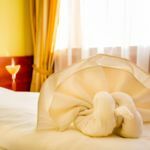 Rooms are equipped with shower or bath, hairdryer, toilet, television, telephone, fridge, internet wireless connection of no charge. Five rooms have balcony. Apartment is equipped with separate toilet, bathroom with bath, hairdryer, television, telephone, internet wireless connection of no charge, large living room and balcony. In hotel there is free wifi connection, lounge, children’s room and bar. In the hotel area is the wellness centre, massages, mini fitness, play room, billiard at our guest’s disposal. In front of the hotel there is a parking place under the constant camera surveillance of no charge, summer terrace, little basketball playground, children playground, open fireplaces, restaurant Koliba Bystrina and camp site. Close to our hotel there is a football playground, summer bob slide, ski centre Žiarce and tennis curt. Reserve your accommodation and Hotel Poľovník Demänovská Dolina will directly send the confirmation in 1 workday. The rating of Hotel Poľovník Demänovská Dolina is 9 from the maximum 10, 4 based on actual and valid guest ratings and reviews.